The use of high quality photographic printer paper along with a dye for visualizing spray deposition has been proposed by Dr. Andrew Landers of Cornell University. Although more expensive, water sensitive paper (WSP) can also be used in a paper patternator. Drill a 3/8” or 7/16” hole in the 2” face of the 2”x4”. The hole will go completely through the 2” face of the 2”x4”. The hole should be about 3 feet from the bottom end. Run an 18” piece of rope or twine through the hole. Cut photographic printer paper into 3”x4” cards. Write information on back of card identifying its position on pattenator. Attach photographic printer paper cards to the 4” face of the 2”x4” with push pins. The cards can be attached at any interval chosen. Cards placed every foot will give a good indication of spray deposition. 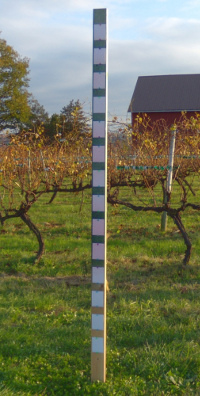 For more accuracy cards can be placed every 6 inches. Drive the T post about 1 foot in the ground. Attach the paper patternator to the T post with rope or twine. After spraying allow the spray cards to dry. Place the spray cards in resealable plastic sandwich bags. Important: To avoid the possibility of pesticide contamination, all equipment utilized should be dedicated for use only with the patternator. Use only clean water and a dye in your sprayer when testing with a paper patternator. Do not use a pesticide mixture.